The administrative office of the Federal Airport Authority of Nigeria, FAAN, located inside the ever busy Benin City airport was this morning shut down by the Edo Board of Internal Revenue (BIR), over alleged unremitted N15 million Pay As You Earn (PAYE) deductible tax from staff salary. 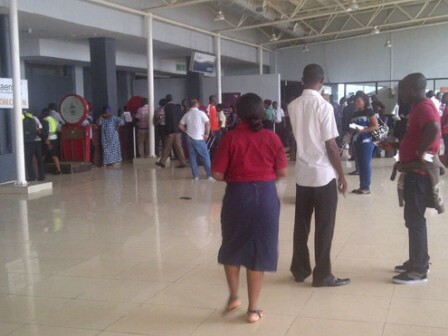 Hundreds of air passengers who were to travel by air to either Lagos or Abuja were locked out of the entrance and exit gates of the airport. Also, passengers of the only Arik aeroplane which landed early in the morning were neither allowed to go out of the gates of the airport. Chairman of Edo BIR, Chief Oseni Elamah told reporters that the action followed failure of FAAN to remit N15 million pay as you earn (PAYE) tax deductible from workers’ salary for the year 2011. “In the past, we had to use judicial means to get the money from them. This time, we served them notice but they failed to respond to it. It was, however, gathered that the office was shut, the airport management allegedly locked the two gates leading to the airport, making it impossible for passengers to either go in or come out of the airport. Following this development, Chief Elamah, who supervised the exercise, had the gates opened, saying that it was the administrative office of FAAN that was locked, and not gates of the airport. “It was a deliberate attempt to blackmail us. It was their office we sealed, and not the gates,” Elamah said. The Benin City airport manager, Mr. Sunday Ayodele could not be reached for comments as he was seen whisked away by operatives of the State Security Service. Meanwhile, air travellers were stranded in other parts of Nigeria on Tuesday after the Benin airport was shut. Between eight and ten flights operate at the Benin airport daily and only one Arik Air plane had successfully landed before the sudden closure. “We landed this morning but we cannot take off again. The airport is shut,” said Banji Ola, spokesperson at Arik Air. The Federal Airports Authority of Nigeria, FAAN, condemned the closure, saying that the Edo State Government does not have the right to shut the airport. “Edo State Government shut down Benin Airport in pursuit of tenement rates. Article 25 of the act establishing FAAN exempts the authority from such payments,” said Yakubu Dati, spokesperson of FAAN. “The Authority shall be exempted from the payment of taxes and tenement rates and any arrears whatsoever in connection thereto,” states the Federal Airport Authority of Nigeria Act 2004 establishing Federal Airports Authority of Nigeria. Arik Air and Aero Contractors all fly to Benin from Lagos.